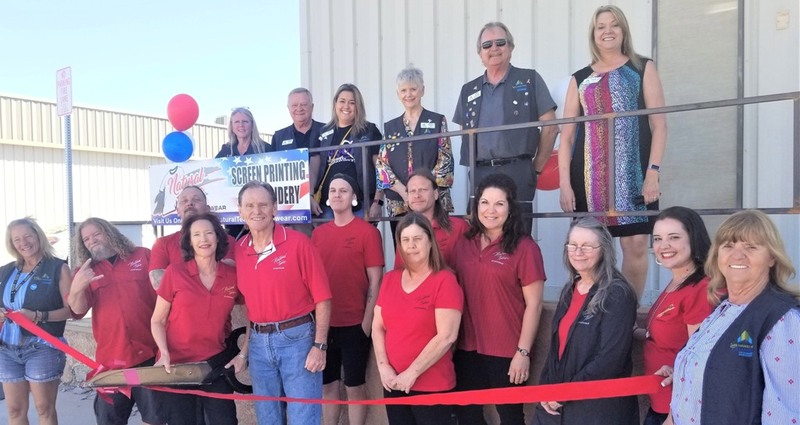 Natural Tease Inc., Sportswear owners, Nancy and Dave Leamons, joined staff, friends, and Lake Havasu Area Chamber Ambassadors to cut the ribbon celebrating 37 years in business. Natural Tease supplies screen printing and embroidery for events. Uniforms for custom accounts and souvenir designs to the resorts and grocery stores. Some staff at Natural Tease have been with the company for between 21 and 31 years. Attending the ceremony from left to right bottom row were Jennifer Whetten, TJ Ayers, Bradley Payton, Nancy and Dave Leamons, Nick Twaddell, Cathy Kyle, Erick Diaz, Michelle Diaz, Jacque Pirog, Krystal Arreola & Sharon Oakley. Upper Row: Audrey Hoyt, Marshall Ronningen, Sarah Stinnett, Kathy Ronningen, Steve Bentley and Lisa Krueger.